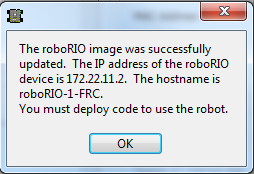 Before imaging your roboRIO, you must have completed installation of the FRC Update Suite. You also must have the roboRIO power properly wired to the Power Distribution Panel as described here. Make sure the power wires to the roboRIO are secure and that the connector is secure firmly to the roboRIO (4 total screws to check). The roboRIO Imaging Tool will be used to image your roboRIO with the latest software. Connect a USB cable from the roboRIO USB Device port to the PC. This requires a USB Type A male (standard PC end) to Type B male cable (square with 2 cut corners), most commonly found as a printer USB cable. Note: The roboRIO should only be imaged via the USB connection. It is not recommended to attempt imaging using the Ethernet connection. The device driver should install automatically. If you see a "New Device" pop-up in the bottom right of the screen, wait for the driver install to complete before continuing. The roboRIO imaging tool and latest image are installed with the NI Update Suite. Launch the imaging tool by double clicking on the shortcut on the Desktop. If you have difficulties imaging your roboRIO, you may need to try right-clicking on the icon and selecting Run as Administrator instead. 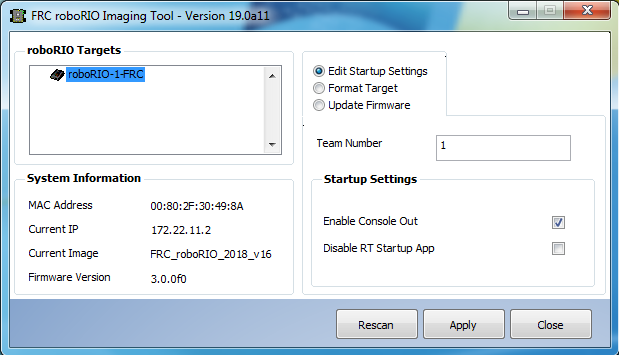 Edit Startup Settings - This option is used when you want to configure the startup settings of the roboRIO (the settings in the right pane), without imaging the roboRIO. Format Target - This option is used when you want to load a new image on the roboRIO (or reflash the existing image). This is the most common option. Update Firmware - This option is used to update the roboRIO firmware. 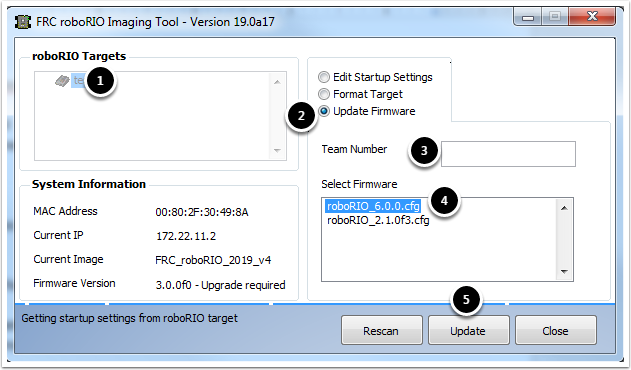 For this season, the imaging tool will require roboRIO firmware to be version 5.0 or greater. 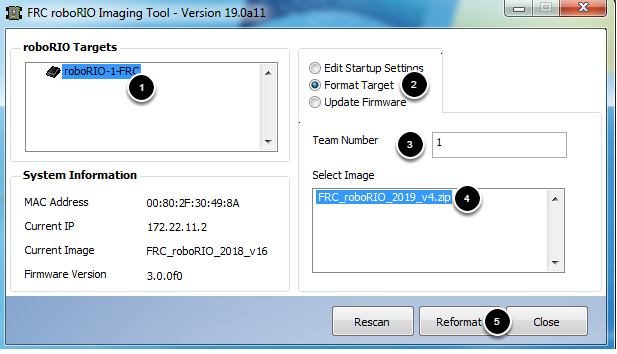 RoboRIO firmware must be at least v5.0 to work with the 2019 image. If your roboRIO is at least version 5.0 (as shown in the bottom left of the imaging tool) you do not need to update. Make sure your roboRIO is selected in the top left pane. Select the latest image version in the box. Click Reformat to begin the imaging process. The imaging process will take approximately 3-10 minutes. A progress bar in the bottom left of the window will indicate progress. When the imaging completes you should see the dialog above. Click Ok, then click the Close button at the bottom right to close the imaging tool. Reboot the roboRIO using the Reset button to have the new team number take effect. Note: The default CAN webdash functionality has been removed from the image (CAN devices will still work from robot code). You will need to use the tools provided by individual vendors to service their CAN devices. 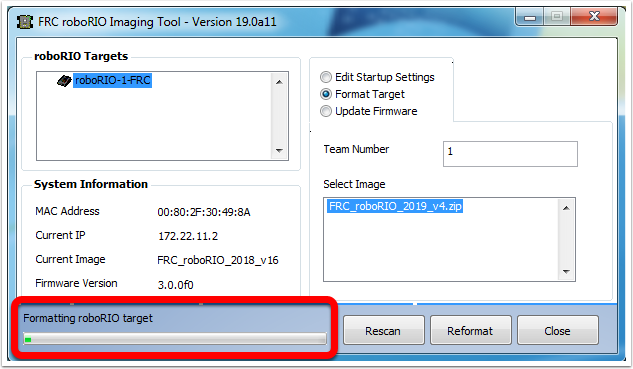 Try running the roboRIO Imaging Tool as Administrator by right-clicking on the Desktop icon to launch it. Try accessing the roboRIO webpage with a web-browser at http://172.22.11.2/ and/or verify that the NI network adapter appears in your list of Network Adapters in the Control Panel. If not, try re-installing the NI Update Suite or try a different PC. Try booting the roboRIO into Safe Mode by pressing and holding the reset button for at least 5 seconds.